As I mentioned in my previous post my friend Alison is getting married next year. Our friend Heather is making her wedding dress for her, so yesterday the three of us took the train up to New York to do some fabric shopping for the dress. Alison’s mom was also taking the train down from Massachusetts to meet us. Since her train got in about an hour after ours we wandered around a little and stopped and got some crepes for second breakfast. Then we headed back to the train station to pick up Alison’s mom. Unfortunately a switch problem at Penn Station made her train an hour and half late. Instead of waiting around the train station forever we decided to go ahead and start shopping. We wanted to wait for her to buy the real fabric for the dress so we started with some trip shops looking for ideas for things like hair pieces. I’m not very crafty and don’t sew at all, so most of these places were lost on me. I wouldn’t have the first clue what to do with most of this stuff. We did stumble across a place called East Coast Trim that was the prettiest, most hipster looking trim shop. I still wouldn’t know what to do with anything in there, but it was all really pretty to look at. After Alison’s mom’s train finally got in we hit up Weaver’s for fabric. Heather had gone shopping there for costume fabric with her boss recently and decided it was a good place to hit up for the wedding dress fabric. I won’t give anything away, but we found what we were looking for there. We had a whole list of places we could hit up if need be, but it was nice that Alison found something that fit what she had in mind there. Also Sonny the proprietor of the store was awesome, and I’d definitely recommend shopping there if you’re in New York and are looking for some fabric. While we were waiting for Alison and her mom to get there from the train station I spotted this fabric. Initially I was just thinking I really like that pattern. 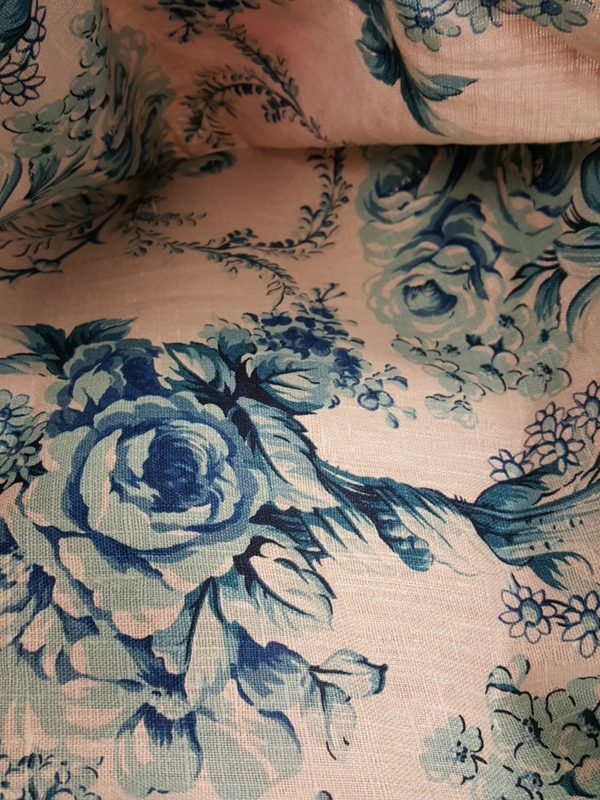 Then I touched it and realized that it was a heavier fabric and I started thinking that would actually make a nice table cloth and it would match my dining room. As I mentioned I have no sewing skills, so I still was mostly just saying that off-hand and not thinking I would actually get it. Then Heather said she would turn it into a table cloth for me. Obviously I didn’t know the measurements for my table off the top of my head, so I told her let me text Paul for the measurements. It often takes him hours to notice he has a text message, so if he texts me back before we leave the store then it was meant to be and I’ll buy it. If not, I’m not supposed to get it. He texted me back immediately, so apparently it was meant to be. After that we headed to Mood, which is a large fabric store made famous by contestants on Project Runway shopping there. We went there to find thread, a zipper, and fabric for the lining of the dress. I’m not completely useless because I found both the thread and fabric that matched the fabric we bought for the dress. They didn’t have a huge zipper selection and we didn’t find what we needed there. On the way we passed a shop called Zipper and headed back over there to find one. I have no need for a zipper, but that store was amazing and made me want to buy one just because. In addition to the hundreds and hundreds of pre-made zippers they had in every size and color you could also make your own zipper in any length, color, with any of the hundreds of pull choices you wanted. It was very cool. Not surprisingly we found what we were looking for there. We decided to grab lunch after that since it was already after 2 pm. We wandered around a little bit more after lunch and then dropped Alison’s mom back at the train station. The three of us walked over to Koreatown and wandered around for awhile before settling in at a coffee shop to be able to sit down and get out of the cold. We originally had dinner reservations at 6, but since we ate lunch so late none of us were hungry. We canceled those reservations and I wound up heading back to the train station a bit early. I grabbed a sandwich in Penn Station to eat on the train instead. It was a fun day trip, and I’m happy we accomplished what we went up there to do.